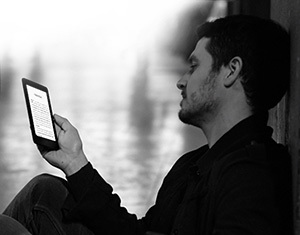 Kindle Voyage can be read in bright sunlight or total darkness—and it's smart enough to know the difference. The new adaptive front light automatically adjusts the brightness of the display based on your environment, and can even be fine-tuned further to your personal preferences. When reading in the dark, the adaptive front light slowly lowers the display's brightness over time to match the way the eye responds to darkness. 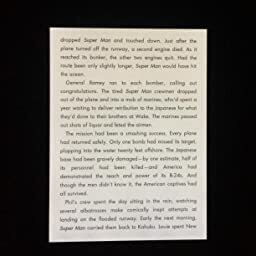 X-Ray’s new timeline view lets you easily flip through notable passages to remind yourself of what’s happened in the book, or navigate easily through images. X-Ray lets you explore the "Bones of the Book." See all the passages across a book that mention relevant ideas, fictional characters, historical figures, places, or topics of interest. With About the Book, see information about the book as you start to read, including its place in a series and author information, plus mark it as "Currently Reading" on Goodreads. Q: do any paperwhites have sound? Q: Does it have text-to-speech ? A: No, it does not. I wish it did. I have both Voyage and Paperwhite. The battery life is the same or very similar. The screen resolution is the same. Voyage is lighter by less than 1oz (25 gram weight difference). 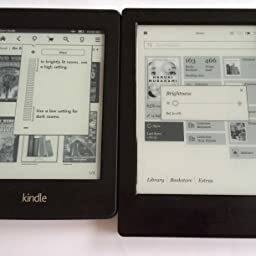 This is a negligible difference, a typical kindle cover is several times heavier than the difference in weight between the two devices. 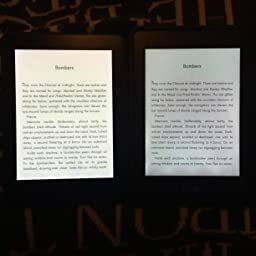 I gave both devices to play around to a few friends who were not very familiar with Kindles. Nobody has a strong preference-- about half liked Paperwhite a bit better, the other half slightly preferred Voyage. I personally like a slightly sturdier feel of Paperwhite but it is a matter of taste. Other reviews mention that Voyage uses costly materials it may be true but it did not make the product any better. 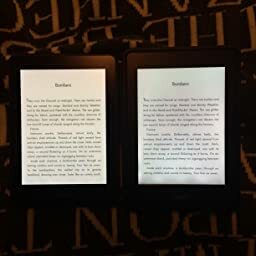 The reading experience on two devices is identical. The main difference is that Voyage has a few more LEDs to brighten the screen. This means that when the screen of Paperwhite is at maximum brightness it looks identical to the screen of Voyage when Voyage is at about 80% of the max brightness. I never felt that my Paperwhite is not bright enough, in fact when I read at night I use it at 50% brightness. Thus having a slightly brighter screen is not worth anything to me. The difference in brightness is so small that I can only notice it when comparing devices side by side. The other difference between Paperwhite and Voyage are the page turning buttons on Voyage. I did not have any issues with page turning on Paperwhite, for aesthetic reason I prefer not to have extra buttons but it does not really make a difference either. Finally, Voyage can automatically adjust screen brightness. Unfortunately, I found that this feature did not work well for me-- to get to the brightness that I prefer I had to make manual adjustment so I disabled that feature (it is disabled by default probably because many users prefer not to have it). One more observation-- origami cover is a neat idea but is absolutely useless-- it turns into a not so sturdy book stand-- for a small minority of users who are in a habit of reading while seating at a desk with a book in a book stand it is better just to pick up a book stand and keep it on a desk. 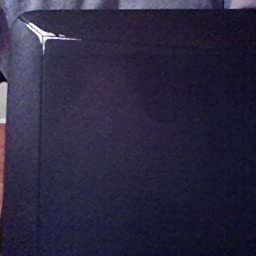 For most people the origami cover dramatically increases the weight of the product without much benefit. I prefer to keep my kindle's in a sleeve. It is sleeve-- this way when I read I can hold the kindle without holding the extra weight. IMO sleeves are a better and cheaper choice for both Paperwhite and Voyage. 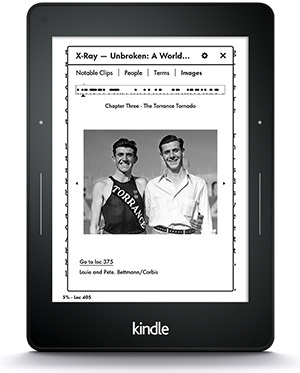 Amazon pushes Amazon Kindle covers very hard because they make more money on covers than on Kindles themselves. The bottom line-- Paperwhite and Voyage are basically identical, if the price were the same choosing between the two would be difficult. Considering an enormous price difference the choice is obvious. I've got mixed feelings on this one, unfortunately. 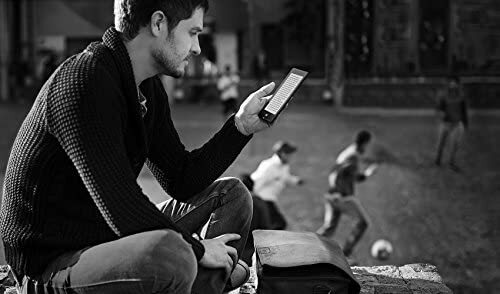 This review is coming from a kindle enthusiast who has owned or used nearly every variation of the device since the 1st generation. It's noticeably smaller and lighter than the Paperwhite. When I saw the specs it didn't really strike me as something that would make much difference to me, but in real life it's actually great. The Voyage fits into a few of my coat pockets that the Paperwhite was just a little too big to fit into. I know there's a separate product page for the origami cover, but it's worth mentioning here as it is the "official" cover. The origami cover is ugly and I was skeptical, but I actually love it. It's weird because it opens by flipping over the top like a notepad. This actually makes it more comfortable to hold when the cover is open, in my opinion. It's hard to describe, but there are a lot more ways to hold the Voyage when it's attached to this cover, and just generally is more comfortable to use. The origami part of the case works great as well... it stands vertically or horizontally (if you're laying down and reading, this is amazing). The other great new thing about this case is that the Voyage attaches to it magnetically. It attaches and detaches very easily, unlike the Paperwhite which seemed to be nearly permanently attached to the standard case. This is great because if you decide you want to read the device and appreciate how light/thin it is without a case attached, it's super easy to take it out. It's pricey but worth it. One of the new features is PagePress, which has sensors on the outer edge of the device that you can squeeze to turn pages. The device lets you adjust the sensitivity between low/med/high -- by default it's set to medium. I found medium to require squeezing way too hard, what felt unnatural and more than any button would or should require to advance to the next page. I adjusted it to "low" and it works perfectly now. Thumb rests on the sensor, and a gentle squeeze advances the page, and haptic feedback (a tiny vibration/buzz) is there to give you a tactile response that the so-called button was pressed. The haptic feedback can be adjusted (low/med/high)or disabled as well. It doesn't trigger accidentally like I feared it might, and I actually really like it. 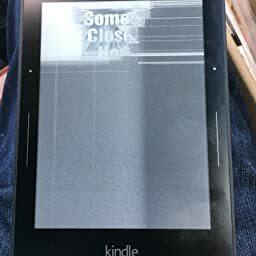 The device now has a light sensor in the top left corner that is supposed to detect ambient light levels and adjust the brightness of the Kindle accordingly. I've had very mixed results with this. First, auto brightness is disabled on the device by default -- which seems odd given that it's one of the key new features of the device. The auto brightness worked very briefly when I first got the device, but it always seemed to be a little off from how I would like the screen to look. In lit rooms, it tended to be a little on the darker side, and in dark rooms it was too bright. Well, shortly after using the Voyage the auto brightness quit working altogether. I restarted the device a few times with no luck. After contacting support, they asked me to proceed with a factory reset. It's worked again since then, but doesn't leave me with a ton of confidence since it started acting up so quickly after getting the device. I've seen the reports online of users who have a "two toned" screen -- blueish on the bottom, yellowish on the top. I'm afraid to say that I have experienced this as well. 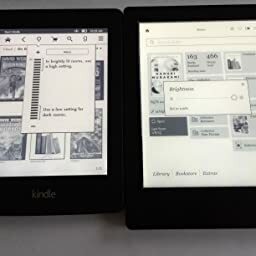 Spending upwards of $200 for a luxury ereader, it's really surprising and disappointing that they haven't got this figured out by now -- this is supposed to be a premium device and it's the 3rd generation frontlit reader for amazon. This is reminiscent of the Paperwhite V1 launch with all of the splotchy lighting -- while it was a huge leap over the prior generation, you expect something like this to work perfectly. It doesn't. The Paperwhite V1 had splotchy lighting, Paperwhite V2 was supposed to have "improved" lighting -- which it did, but still wasn't perfect (mine still had some bright spots)... but to be honest, the lighting on my Paperwhite V2 looks better and more consistent than the Voyage. It's unfortunate that this is a step back. I hope this isn't a widespread issue, but I fear that it is after seeing numerous users on other forums posting about it and sharing pictures of their device. It'll be a shame if the only upgrade next year will be a Voyage V2 with "improved lighting", just like what happened with the Paperwhite. I'll be more skeptical about being an early adopter next time. Aside from the uneven lighting, which I can't decide how distracting it is, the contrast and picture quality of the screen is outstanding. 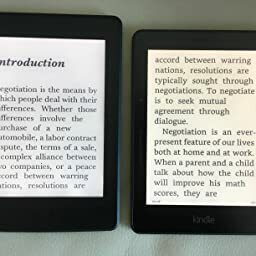 When I compare the text from my Paperwhite V2 to the Voyage side-by-side, the text on the Paperwhite almost looks blurry -- which I wouldn't have believed until I saw it myself. In conclusion, my favorite things about the Voyage are how much more comfortable it is to use (the origami cover offering more ways to hold/use the device, the pagepress sensor working great), the quality of the screen is outstanding, but the uneven lighting and flakey auto brightness are leaving me disappointed. I'm not sure if these were rushed out too quickly or if Amazon has poor quality control, but either way it's unacceptable. Good but the Paperwhite suits me better. I have waited for two months since I purchased my Kindle Voyage to write this review so that I could provide an accurate assessment. 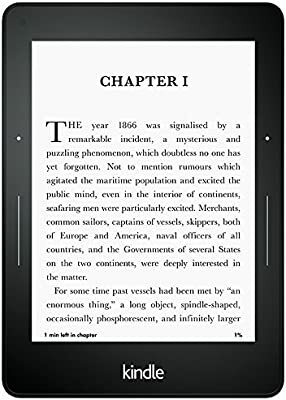 I bought this to replace my Kindle Paperwhite which I have owned for 3 years. Spoiler: I like the Paperwhite better. 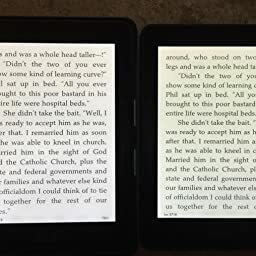 There are pros and cons to each of these ebooks not the least of which is that the Paperwhite costs less and I find it to be more comfortable to read on. The Voyage has a great screen and easy to use settings. It has slightly less weight but not enough to make much of a difference. Page Press buttons are more of an irritant than a help. If you hold it normally it is easy to accidentally turn the page when you don't intend to. The battery doesn't last as long as the Paperwhite - don't know why this is... I read several hours a day and get about 3 days before I need to recharge it. They say I should get 3 weeks but that is based on 1/2 hour per day reading time. Both are good readers but personally I prefer the Paperwhite. 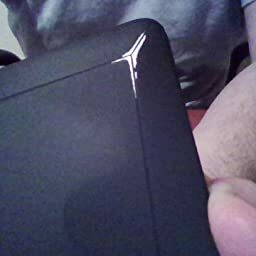 I love ebooks but at 14 months, under light use, good conditions, good care, this kindle froze permanently. One morning it worked, that evening it stopped. There was no special event (it wasnt dropped) that would have changed its status, it just stopped working. In my opinion this is a hardware defect. By Google search I found this isn't uncommon and when it happens they become bricks like this one did, and Amazon doesn't cover this problem.. Amazon's "Kindle Support" responded by offering me a new replacement which at first I thought was great until they revealed the price of the replacement: $189 plus tax and shipping. In other words they were selling me a new one. Amazon's normal customer service cannot deal with any Kindle complaints so there's absolutely no way to get normally high quality Amazon customer service. They just transfer you to the overseas kindle department. If you buy this expecting a normally high quality Amazon customer service experience just be aware it doesn't exist for this product. They farm it out to overseas departments whose job is purely to let you down and sell you a new one. They explain the warranty is for 12 months so at 14 months its out of warranty and there is no coverage and no way to repair it, and they try to sell another one under the guise of a discount. At $199 I would think you could rely on getting more than 14 months especially under light use. 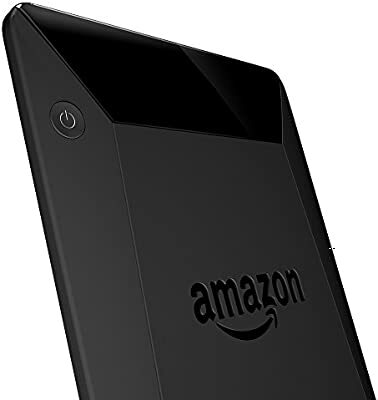 If there is a hardware defect issue - and I believe there is - then I would expect Amazon to step up to the plate and replace their defective product. It's one of the worst customer service experiences I've encountered. Therefore I would not recommend this product. I find all of these things to be great advantages in using the Voyage. My mother's Paperwhite is not quite as clear as my Voyage, and I do appreciate the difference (although I'm not sure I would have cared had I never seen the difference). I do have one complaint: I like to see the page numbers rather than the minutes left in chapter/book or the location. The Voyage is far less responsive to clicks at the bottom of the page to change what is displayed there than the Paperwhite is. I'm not sure whether this is just mine or whether they're all like this, but I often have a hard time getting the Voyage to change what it displays in the bottom left corner. 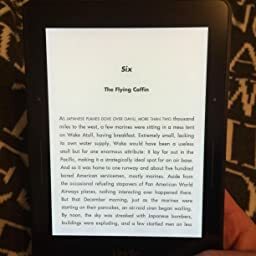 I would also really like Amazon to provide page numbers in all books - I had a Barnes & Noble Nook before and that always showed page numbers. This is a complaint for Amazon, though, and not about the Voyage specifically. 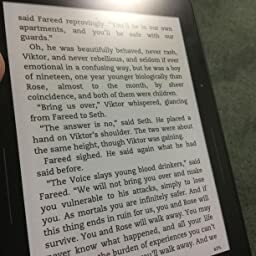 Overall, the Voyage is an excellent, easy to use e-reader and I am loving it. I have been a dedicated kindle user for many years and read over 100 books per year. In November 2014 I purchased a Kindle Voyage after the page turn buttons on my Original kindle stopped working. As it was 4 years old, I felt I had my money's worth. 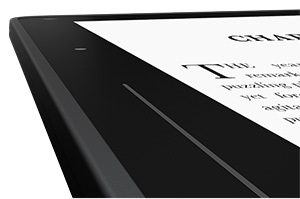 I loved the new Kindle Voyage, however after the automatic software update a few weeks ago, it stopped working. After multiple calls to technical support and customer service over a three week period, the only option I was given was to buy a new one as it was out of warranty. 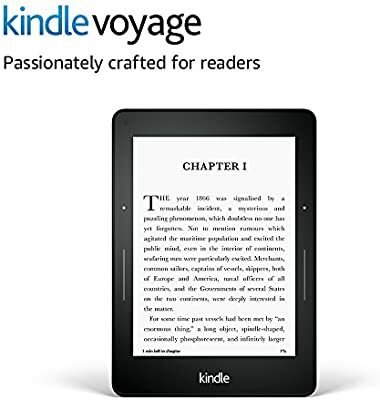 As the Kindle worked fine prior to the software update, the price of the Voyage is high for only getting 14 months use out of it. I decided to get the Voyage when I lost the Paperwhite. The only reason I shelled out the extra $80 for the Voyage is because of the page press. I switch hands holding the Kindle when I read and I thought it would be nice to be able to turn the page when I hold it with my left (I know, first world problem). However, I was sorely disappointed. Sometimes the response lagged greatly, other times it would jump two pages with one press. I ended up just using touchscreen to save myself the trouble of relocating. Personally I also feel the loading is not as fast and smooth as the Paperwhite. Maybe I just got a lemon.